This has been quite a roller coaster week. Where to start from? First off, hope you enjoyed our post last week? During the last weekend, there was a crazy flood in Lagos, Nigeria. One guy is spending almost a million to fix his car because he needs to buy a new engine. I saw it on Twitter and ended up going to the same workshop because I also had to replace something in my car. The cost of mine is like 2% of his cost but mhen, it was so unplanned I had to go to my favourite spot and step down with Coke and lime on ice. I also want to pay respect to Bradley Lowery, a young boy that died at the young age of 6 from cancer, my friend’s elder brother, whom I’ll keep anonymous, but was a Warrant Officer in the Nigerian army and members of the armed forces all over the world. Thank you for protecting civilians like myself. I’ve always dreamt of being in the military, an organisation that represents something greater than myself and comprises those that I call the best of us. 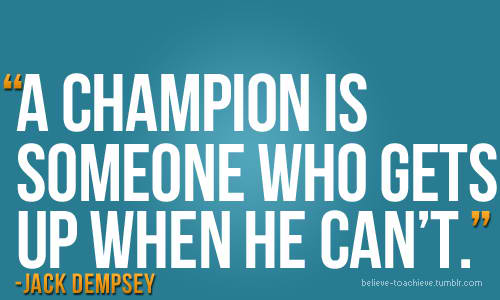 What does it mean to have the heart of a champion? Quite simply, it means believing in our ability to succeed and overcome regardless of what our current circumstances may say. It is not an easy thing to do but as believers, it is what we must do. If you think about it, that’s what faith entails (Heb. 11:1-3). In order to have faith, you need to have the heart of a champion. Faith is us saying: I am rich even when the present circumstance says otherwise; I am healed even when the sickness is terminal. When I think of this, Bradley Lowery comes to mind. This was a kid with the heart of a champion. Despite the fact that he had terminal cancer, he was seen smiling, playing football, having a bed party and not allowing his sickness stop him from enjoying life and putting smiles on the faces of people. Our hero in the Three Musketeers, D’artagnan is another person with such a heart and this is one of the reasons I love him so much. Even when facing the enemy with the threat of being overcome by bullets, you'll only hear one thing from him: "CHARGE!" There are so many examples in the bible of men who had the heart of a champion. One of such people is King David; a man after God’s heart. No matter the situation, he faced it headlong believing that he would overcome the obstacle. A bear came, no problem. A lion? No problem. Goliath? He and his men returned back to their city and their families had been taken captive. This is an example of when life gives you lemons. His men spoke of stoning him. Imagine being the leader of a team and you hear your team members plotting to get you fired. But what did he do? He strengthened himself in the Lord, sought God for direction on what step to take and went after the enemy. That is what is expected of us. Make lemonade from the lemons life throws at you. How? By going to the creator of the lemon; God and strengthening yourself in Him. Afterwards, do like D’artagnan, face the obstacle and scream CHARGE!! The charge therefore this week is to have the heart of a champion (by having faith), face your obstacle and scream charge! Even when you get knocked back or rejected, strengthen yourself in the Lord, pick yourself up like David and go after that thing without fear. Never lose your fight! Remember, fear is the opposite of faith. Also, as you face that obstacle keep smiling and enjoying life like the hero Bradley Lowery did in his great but brief lifetime. RIP Brad and Warrant Officer M. Gone but never forgotten. P.S. I eventually sent the previous posts to my mum. Rest assured my house will undergo a bath of anointing oil soon. In three musketeers news, I wish I didn’t read the remaining series. I have to deal with the fact that my heroes fell out with each other on several occasions. Sigh!